Benford, Robert D., and Snow, David A.. 2000. “Framing Processes and Social Movements: An Overview and Assessment.” Annual Review of Sociology 26: 611–39. Brader, Ted, and Marcus, George E.. 2013. “Emotion and Political Psychology.” In The Oxford Handbook of Political Psychology: Second Edition, edited by Huddy, Leonie, Sears, David O., and Levy, Jack S., 165–204. New York: Oxford University Press. Cannon, Walter Bradford. 1915. Bodily Changes in Pain, Hunger, Fear, and Rage: An Account of Recent Researches into the Function of Emotional Excitement. New York: D. Appleton and Company. Cederman, Lars-Erik, Skrede Gleditsch, Kristian, and Buhaug, Halvard. 2013. Inequality, Grievances, and Civil War. New York: Cambridge University Press. Costalli, Stefano, and Ruggeri, Andrea. 2015. “Indignation, Ideologies, and Armed Mobilization: Civil War in Italy, 1943–45.” International Security 40 (2): 119–57. Costalli, Stefano and Ruggeri, Andrea. 2017. 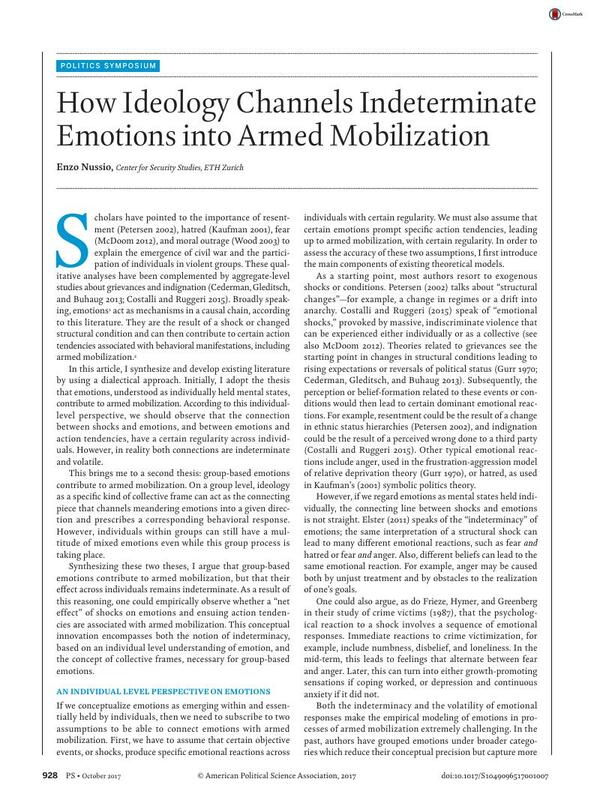 “Emotions, Ideologies, and Violent Political Mobilization: Introduction.” PS: Political Science & Politics 50 (4): this issue. Elster, Jon. 2011. “Indeterminacy of Emotional Mechanisms.” In Analytical Sociology and Social Mechanisms, ed. Demeulenaere, Pierre, 50–63. Cambridge, UK: Cambridge University Press. Frieze, Irene H., Hymer, Sharon, and Greenberg, Martin S.. 1987. “Describing the Crime Victim: Psychological Reactions to Victimization.” Professional Psychology: Research and Practice 18 (4): 299–315. Gurr, Ted Robert. 1970. Why Men Rebel. Princeton: Princeton University Press. Gutierrez, Francisco, and Wood, Elisabeth Jean. 2014. “Ideology in Civil War. Instrumental Adoption and Beyond.” Journal of Peace Research 51 (2): 213–26. Jasper, James M. 2011. “Emotions and Social Movements: Twenty Years of Theory and Research.” Annual Review of Sociology 37 (1): 285–303. Kaufman, Stuart J. 2001. Modern Hatreds: The Symbolic Politics of Ethnic War. Ithaca: Cornell University Press. Kaufman, Stuart J. 2006. “Symbolic Politics or Rational Choice? Testing Theories of Extreme Ethnic Violence.” International Security 30 (4): 45–86. Lab, Steven P. 1990. “Citizen Crime Prevention: Domains and Participation.” Justice Quarterly 7 (3): 467–91. McDoom, Omar Shahabudin. 2012. “The Psychology of Threat in Intergroup Conflict: Emotions, Rationality, and Opportunity in the Rwandan Genocide.” International Security 37 (2): 119–55. Morrison, Kevin M., and Rockmore, Marc. 2016. “Fear and Political Participation: Evidence from Africa.” HiCN Working Paper 226. Households in Conflict Network. Nussio, Enzo, and Oppenheim, Ben. 2014. “Anti-Social Capital in Former Members of Non-State Armed Groups: A Case Study of Colombia.” Studies in Conflict & Terrorism 37 (12): 999–1023. Pearlman, Wendy. 2013. “Emotions and the Microfoundations of the Arab Uprisings.” Perspectives on Politics 11 (2): 387–409. Petersen, Roger D. 2002. Understanding Ethnic Violence: Fear, Hatred, and Resentment in Twentieth-Century Eastern Europe. Cambridge: Cambridge University Press. Shesterinina, Anastasia. 2016. “Collective Threat Framing and Mobilization in Civil War.” American Political Science Review 110 (3): 1–17. Sternberg, Robert J. 2003. “A Duplex Theory of Hate: Development and Application to Terrorism, Massacres, and Genocide.” Review of General Psychology 7 (3): 299–328. Ugarriza, Juan E., and Craig, Matthew J.. 2013. “The Relevance of Ideology to Contemporary Armed Conflicts. A Quantitative Analysis of Former Combatants in Colombia.” Journal of Conflict Resolution 57 (3): 445–77. Ugarriza, Juan E., and Nussio, Enzo. 2015. “¿Son Los Guerrilleros Diferentes de Los Paramilitares? Una Integración Y Validación Sistemática de Estudios Motivacionales En Colombia.” Análisis Político 85: 189–211. Wood, Elisabeth Jean. 2003. Insurgent Collective Action and Civil War in El Salvador. Cambridge: Cambridge University Press.